Skoda has launched an all-new online car browsing tool, called Skoda Live Tour. The new service is being tested with the Octavia and Kodiaq and allows perspective buyers to speak with a team of dedicated experts who can guide them through model features and technical details. 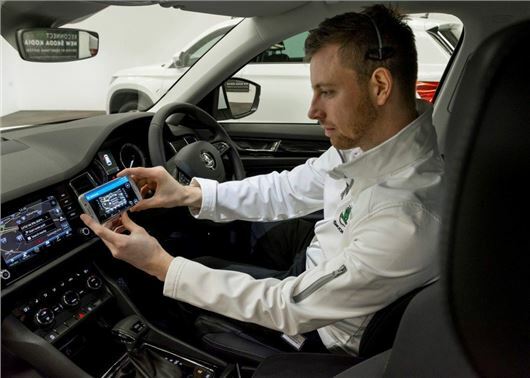 Available through Skoda's website, The Live Tour connects car buyers with a dedicated Product Host via videolink. The Host can guide them around the model, showing specific features that are requested or just a general tour of the car, through a smartphone, wall-mounted cameras and a headset. The online browsing tool won't let you complete the deal, however, but you can complete almost everything else with a full configuration tool that lets you spec the vehicle to your exact needs. You can also ask to be added to Skoda's mailing list and book a test drive. The service is open 10:30 - 21:30 and, unsurprisingly, the busiest times are from 7pm onwards - after most people have finished work for the day. If the trial is successful, The Live Tour could be expanded to the entire Skoda range and allow buyers to complete their transaction online, without setting foot in a dealership. Skoda isn't the first to venture into the world of digital car buying though; BMW, Hyundai and Smart already offer online shopping options for its cars, along with Peugeot.